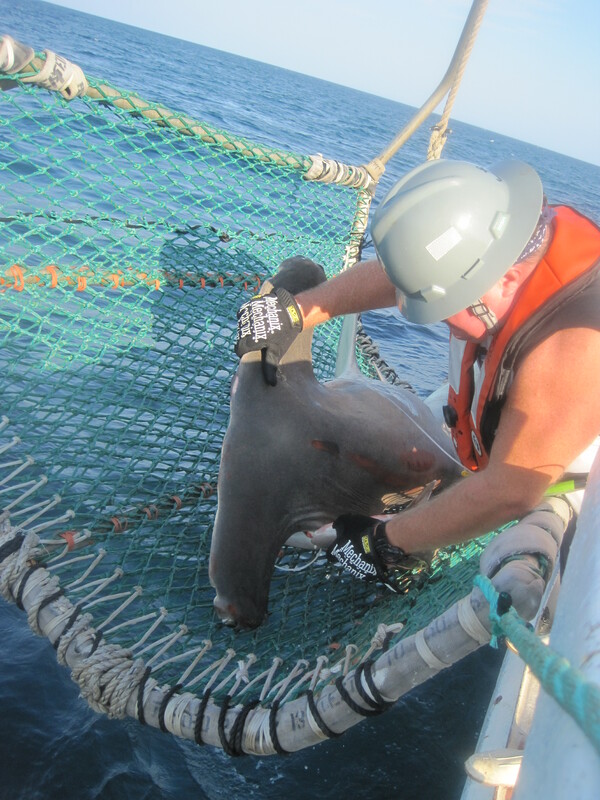 Early this morning the night shift caught and cradled a great hammerhead shark (Sphyrna mokarran). This is a first for this cruise leg. I’m sure that just saying “Hammerhead” conjures an image of a shark with an unusual head projection (cephalofoil), but did you know that there are at least 8 distinct Hammerhead species? 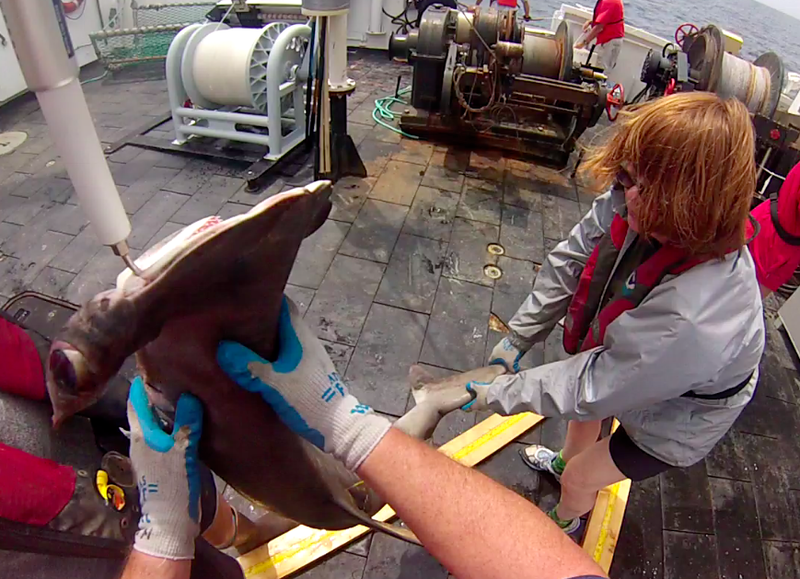 Thus far in the cruise we have caught 4 scalloped hammerheads (Sphyrna lewini), one of which I was fortunate to tag. All eight species of hammerhead sharks have cephalofoils with differences noted in shape, size, and eye placement, to name a few. Research indicates that this structure acts as a hydrofoil or rudder, increasing the shark’s agility. 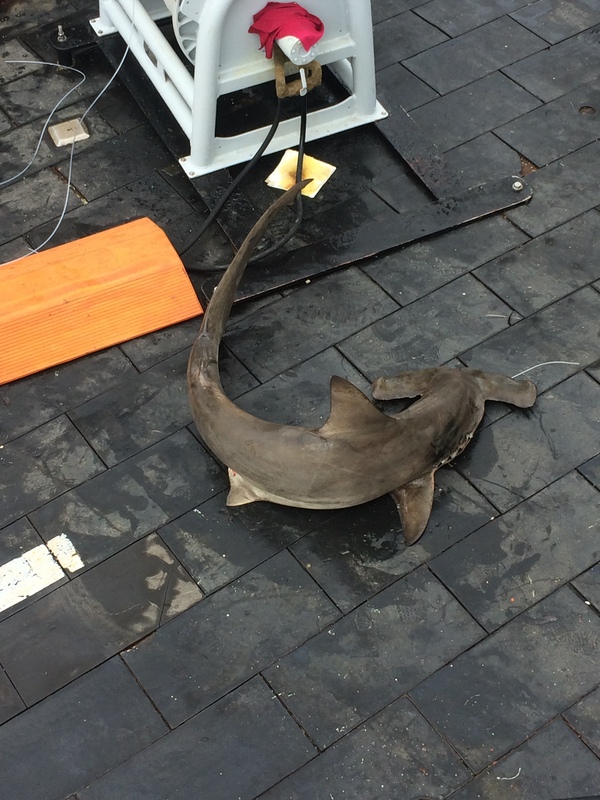 In addition, the structure contains a high concentration of specialized electro sensory organs (Ampullae of Lorenzini) that help the shark detect electric signals of other organisms nearby. The eye placement at each end of the cephalofoil allows hammerhead sharks to have essentially a panoramic view with only a slight movement of their head – quite handy when hunting or avoiding other predators. Great hammerhead sharks are highly migratory. They are found worldwide in tropical latitudes, and at various depths. There are no geographically Distinct Population Segments (DPS) identified. The great hammerhead, as its name implies, is the largest of the group and average size estimates of mature individuals varies between 10-14 ft in length with a weight approximately 500 lb. ; the largest recorded was 20 ft in length. The one we caught was ll ft. in length. As with most shark species, the numbers declined rapidly between 1975 and 1995 due to the fin fishing industry and focused sport fishing often fueled by fear and misinformation. One has to wonder what the average length was before that time. Scalloped Hammerhead sharks are the most common hammerhead species. Their habitat overlaps that of the great hammerhead, though they are more often found in slightly shallower waters. In contrast to the great hammerhead, scalloped hammerheads are only semi-migratory, and scientists have identified Distinct Population Segments around the world. This is important information when evaluating population size and determining which groups, if any, need regulatory protection. The average life expectancy for both species is approximately 30 years. Males tend to become sexually mature before females, at smaller weights; females mature between 7-10 years (sources vary). In my last log I discussed shark reproduction – Oviparous vs. Viviparous. (egg laying vs. live birth). All hammerheads are viviparous placental sharks but reproductive patterns do differ. Great hammerheads bear young every two years, typically having 20-40 pups. A great hammerhead recently caught by a fisherman in Florida was found to be pregnant with 33 pups. Scalloped have slightly fewer pups in each brood, but can reproduce more frequently. Setting and retrieving the Longline requires coordination between Deck Operations and the Bridge. Up until now I’ve highlighted those on deck. 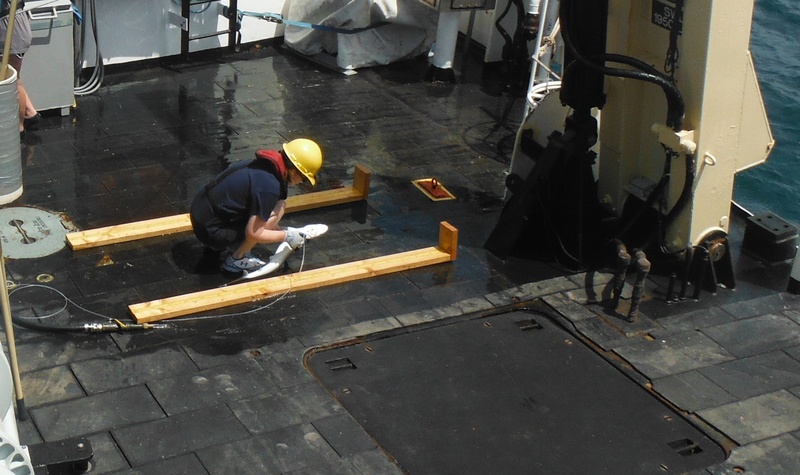 Let’s learn a bit about two NOAA officers on the Bridge. The NOAA Corps is one of the 7 Uniformed Services of the United States and all members are officers. The Corps’ charge is to support the scientific mission of NOAA, operating and navigating NOAA ships and airplanes. Applicants for the Corps must have earned Bachelor’s degree and many have graduate degrees. A science degree is not required but a significant number of science units must have been completed. It’s not unusual for Corps recruits to have done post-baccalaureate studies to complete the required science coursework. New recruits go through Basic Officer’s Training at the Coast Guard Academy in New London, Connecticut. 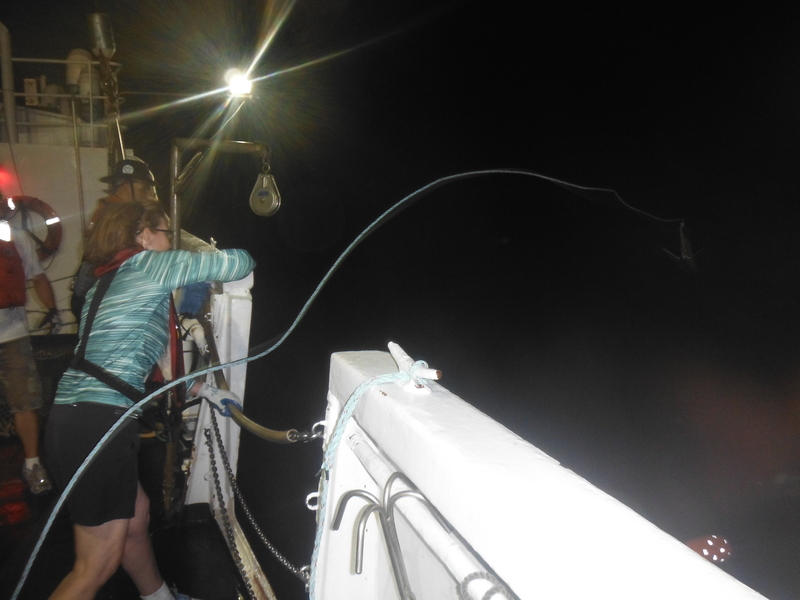 Lt. Lecia Salerno at the helm or the Oregon II during Longline retrieval. 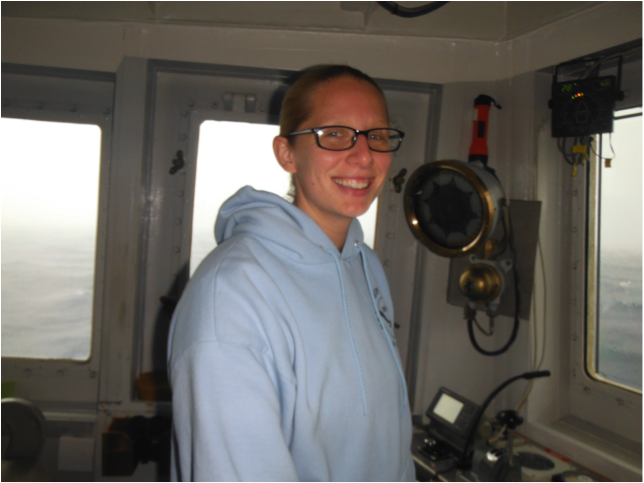 Lt. Salerno is a 10-year veteran of the NOAA Corps and has significant experience with ship operations. She was recently assigned to the Oregon II as the XO. This is Lecia’s first assignment as an XO and she reports directly to Captain Dave Nelson. In addition to her Bridge responsibilities, she manages personnel issues, ship accounts and expenditures. 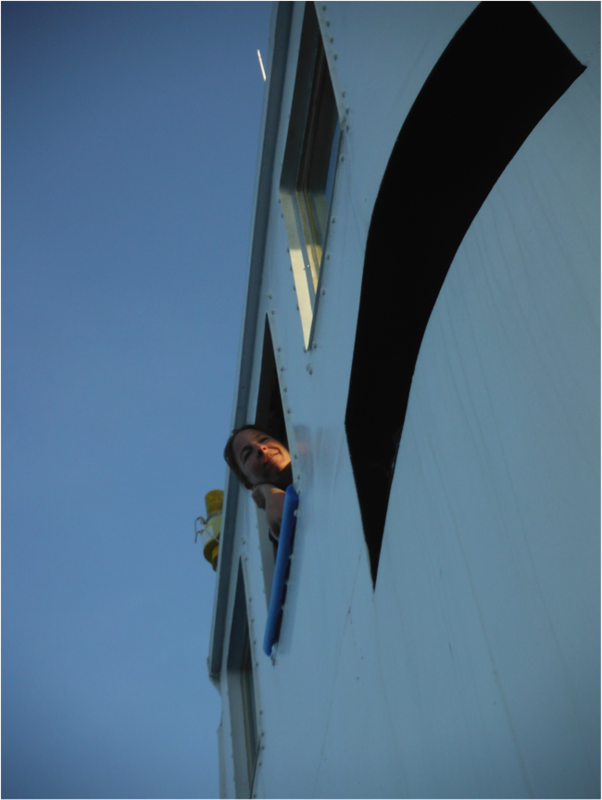 During these first few weeks on her new ship, Lt. Salerno is on watch for split shifts – day and night – and is quickly becoming familiar with the nuances of the Oregon II. This ship is the oldest (and much loved) ship in NOAA’s fleet, having been built in 1964, which can make it a challenge to pilot. It’s no small task to maneuver a 170-foot vessel up to a small highflyer and a float, and continue moving the ship along the Longline throughout retrieval. Lecia has a strong academic background in science and in the liberal arts and initially considered joining another branch of the military after college. 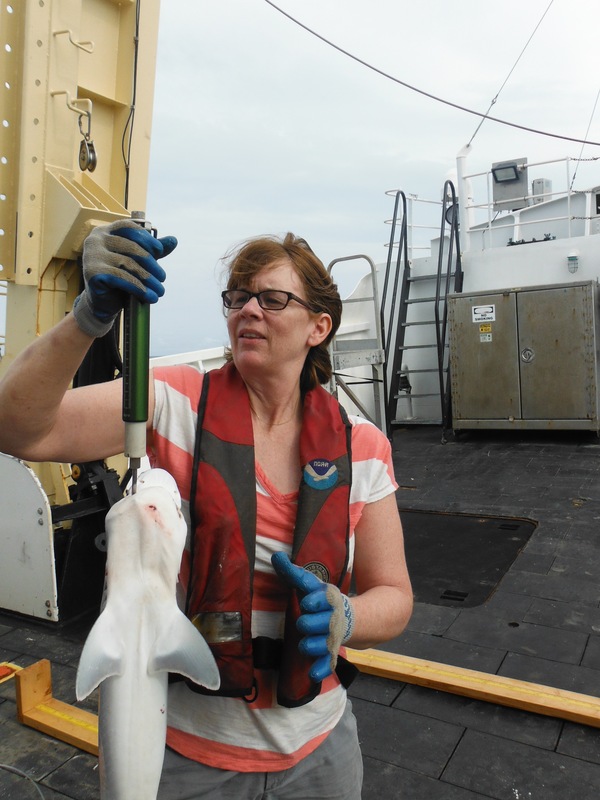 Her assignments with NOAA incorporate her varied interests and expertise, which she feels makes her job that much more rewarding. Laura has always had a love for the ocean, but did not initially look in that direction for a career. She first earned a degree in International Business from James Madison University. Her interest in marine life took her back to the sea and she spent a number of years as a scuba diving instructor in the U.S. and Australia. Laura returned to the U.S. to take additional biology coursework. During that time she more fully investigated the NOAA Corps, applied and was accepted. Laura has been on the Oregon II for 1.5 years and loves her work. When she is on shift she independently handles the ship during all operations and also acts as Navigator. What she loves about the Corps is that the work merges science and technology, and there are many opportunities for her to grow professionally. In December Laura will be assigned to a shore duty unit that is developing Unmanned Underwater Vehicles (UUV). Notice the white spots on the dorsal side of this atlantic sharpnose, characteristic of this species. It’s amazing to think that just over a week ago I held my first live shark. 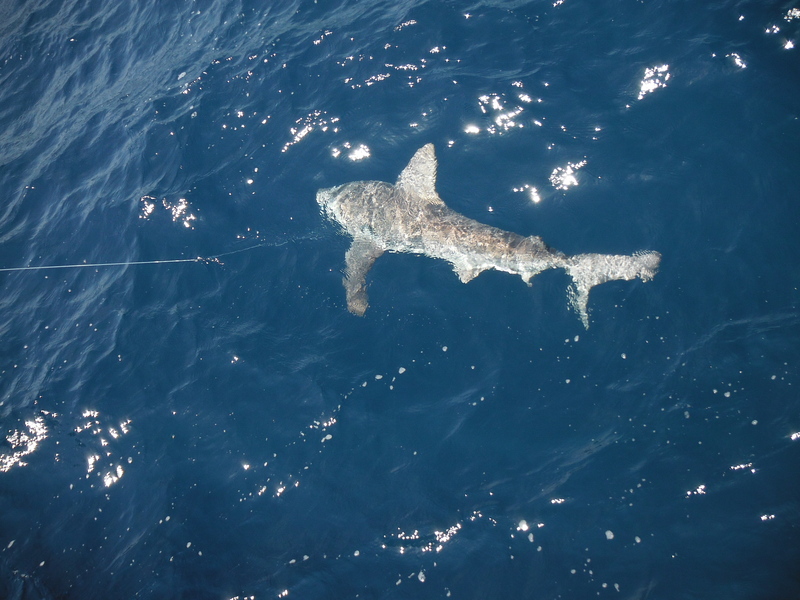 We caught over 30 sharks at our first station and our inexperience showed. At first even the small ones looked like all teeth and tail, and those teeth are not only sharp but carry some pretty nasty bacteria. It took all of us (new volunteers) forever to get the hooks out quickly without causing significant trauma to the shark–or ourselves. A tail smack from this small-but-mighty tiger shark pictured below left me with a wedge-shaped bruise for a week! He’s cute but he taught me a lesson with his tail. Since then we have caught hundreds of sharks. We’ve caught so many Atlantic Sharpnose that on occasion it seems mundane. Then I catch myself and realize how amazing it is to be doing what I’m doing– holding a wild animal in my hands, freeing it from the circle hook (finally! ), looking at the detailed pattern of its skin, and feeling it’s rough texture, measuring it and releasing it back into the sea. 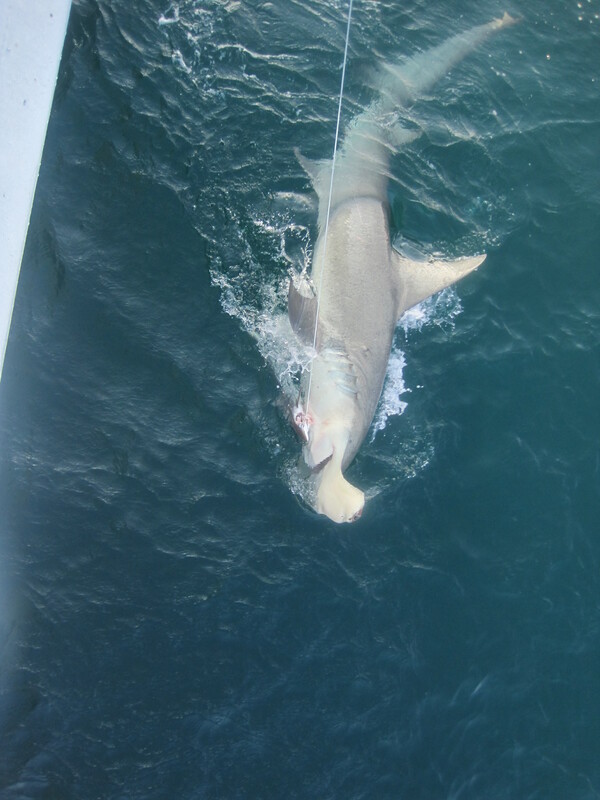 A beautiful sandbar shark on the line. I’m pleased to be able to say that my day shift team has become much more confident and efficient. Our mid-day haul yesterday numbered over 40 sharks, including a few large sharks that were cradled, and it went really smoothly. 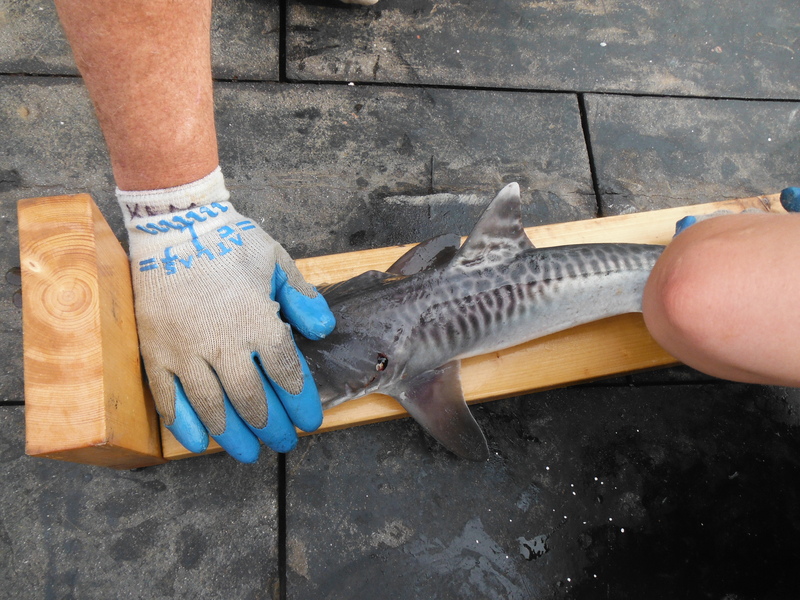 An Atlantic Sharpnose weighing in at 2.1 kg. Taking a closer look at an Atlantic Sharpnose shark. 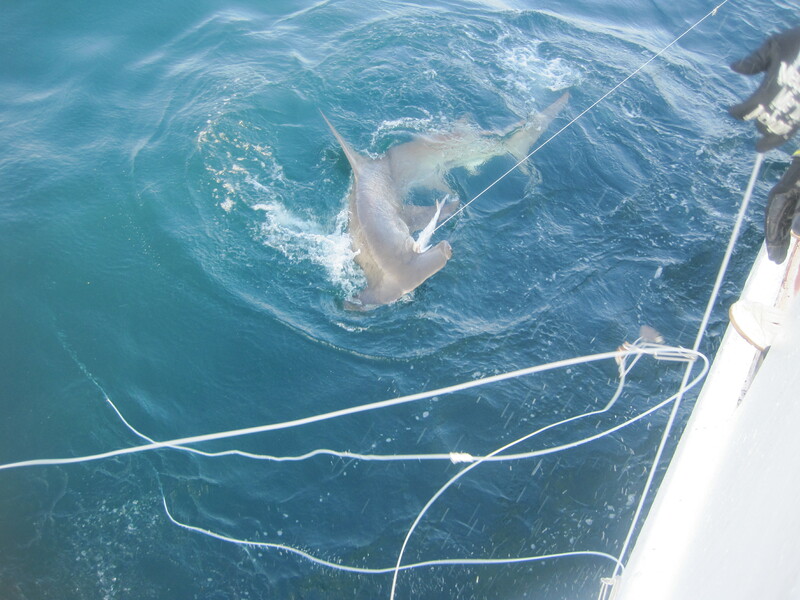 At this point I’ve had a chance to work at most of the volunteer stations including baiting hooks, throwing off the high-flyer marker, numbering, gangions, throwing bait, data entry, tagging shark, removing hooks, and measuring/ weighing. 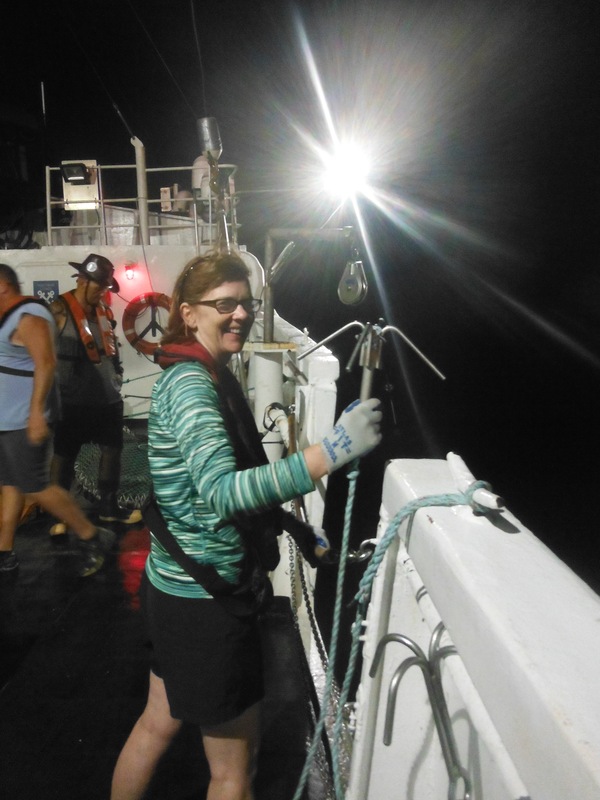 A highlight of last night was getting to throw out the hook to pull in the high-flyer marker at the start of retrieval. I’m not known for having the best throwing arm but it all worked out! For my incoming Marine Science students — Investigate two other hammerhead species. How are they distinguished from great hammerheads? 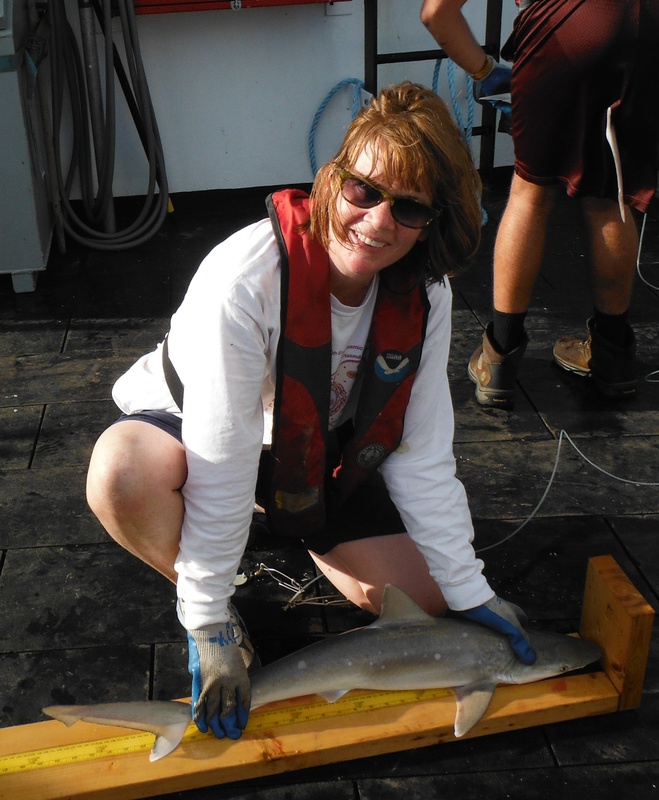 This entry was posted in 2015, Kathleen Gibson, NOAA Fisheries Service, NOAA Teacher at Sea and tagged Dave Nelson, Great Hammerhead, hammerhead sharks, Longline Shark Survey, National Oceanic and Atmospheric Administration, NOAA Corp Officer, NOAA Corps, NOAA Ship Oregon II, placental viviparous, sandbar shark, Scalloped Hammerhead, scalloped hammerhead shark, shark finning, tiger shark. Bookmark the permalink.